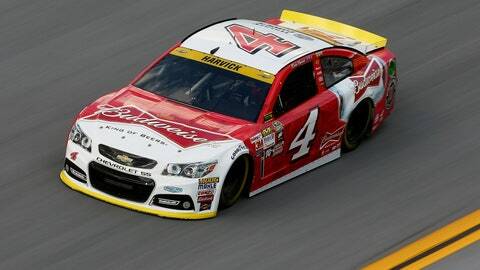 Kevin Harvick drives his No. 4 Stewart-Haas Racing Chevrolet during practice at Talladega. Each of the Stewart-Haas Racing cars had issues clearing NASCAR technical inspection prior to Saturday’s qualifying session at Talladega Superspeedway. According to a NASCAR spokesman, there was an issue with the assembly of the radiator inlets on the cars of Kevin Harvick, Kurt Busch, Danica Patrick and Tony Stewart. The teams were forced to change out the part prior to qualifying, but all four cars eventually cleared inspection and NASCAR did not confiscate any parts. He said the sanctioning body has been pretty tough on the SHR cars all season, and this was more of the same. While Zipadelli said the change would not affect the handling of the cars in Sunday’s race, it was frustrating to lose nearly two hours of work replacing everything surrounding the radiator. According to the NASCAR spokesman, any possible penalties would be announced early next week. 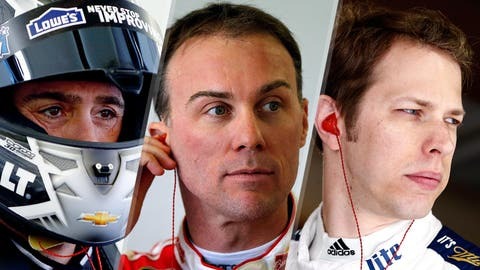 If the penalty results in a loss of points, it could have a big impact on the championship hopes of Harvick and Busch if they are able to advance to the Eliminator Round of the Chase. If that is the case, the spokesman said the appeal process would be expedited and would likely take place prior to next weekend’s race at Martinsville Speedway. Earlier this year, NASCAR expedited Kurt Busch’s appeal after he was suspended ahead of the Daytona 500, getting it done over the course of an afternoon. NASCAR’s Kristi King told FOXSports.com it is possible for any car to have an issue in post-race inspection, which could impact the drivers that advance in the Chase. According to King, if a driver advances into the next round with a win Sunday at Talladega or moves on via a second-place finish, but infractions are discovered which would garner a points penalty, that would not be determined until post-race inspection is complete at the NASCAR R&D Center later in the week. Zipadelli said he hoped there would be no points taken away as a result of the issue, insisting that none of the other teams in the garage are conforming to the rules either.